Welcome Cambie to the Weiser family. Named after the iconic district in British Columbia. Cambie has an idealistic, simplified look. With defined lines and a variety of finishes, you can seamlessly upgrade to a contemporary style. The crisp, clean appearance of the Satin Nickel finish adds to the overall look of the Cambie knob and enhances the modern feel. Welcome Home Series handlesets are the perfect addition to your front door to create a unique and fashionable entryway to your home. Each is stylishly designed to provide maximum-security protection. There are many styles, finishes and configurations from which to choose. The Huntington is distinctive in its beauty and grace. It lends the perfect finish to almost any door. Both knobs/levers can be locked or unlocked by key on the outside, or turn button on the inside. The Satin Chrome finish gives the product a modern and minimalist look. Welcome Home Series<sup></sup> handlesets are the perfect addition to your front door to create a unique and fashionable entryway to your home. Each is stylishly designed to provide maximum-security protection. There are many styles, finishes and configurations from which to choose. The Huntington is distinctive in its beauty and grace. It lends the perfect finish to almost any door. This passage knob/lever is best used in interior hall and closet applications where no locking is required. The knob/lever is reversible and mounts on both left and right handed doors. The Satin Chrome finish gives the product a modern and minimalist look. 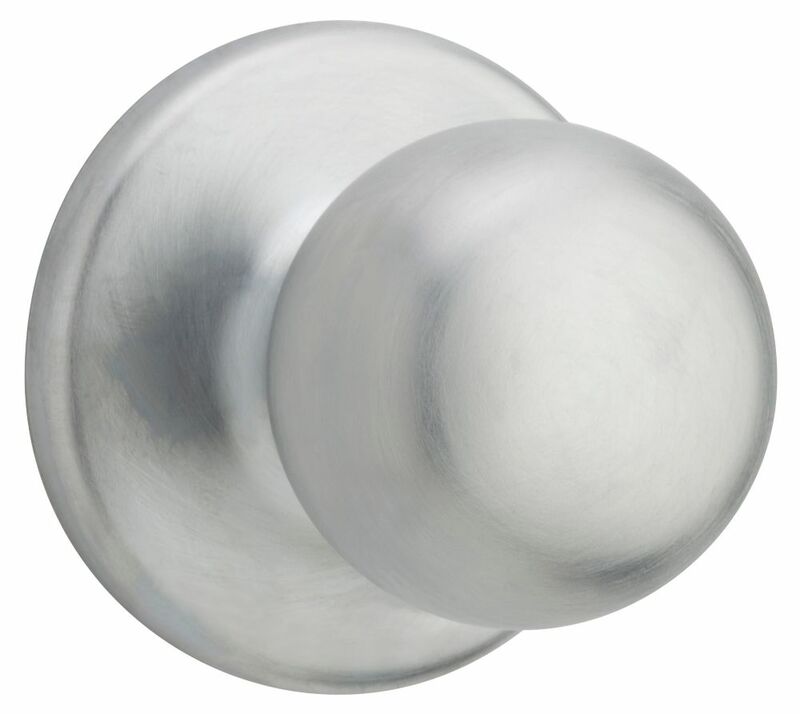 Fairfax Satin Chrome Passage Knob The Elements Series provides an expanded choice in Fashion Doorware at an affordable price. In decorating your home, choosing the right paint, wallpaper, tile and trim is important in creating a personal design. The Elements Series of Fashion Doorware will support and enhance your decorating decisions. Simple, elegant, and clean, the Fairfax knobs fits snug in the palm of your hand This passage knob/lever is best used in interior hall and closet applications where no locking is required. The knob/lever is reversible and mounts on both left and right handed doors. The Satin Chrome finish gives the product a modern and minimalist look.